Late last summer while searching the net for info on the autumn festival of Mehrehgon, I found an interesting link to an Iranian Personals website. I was so excited to see that Iranians finally had such a forum to connect with other Persians. The website was impressive not just by virtue of its existence, but because of the quality of its content. The site asks insightful questions on an individual&apos;s view of politics, religion, family, tradition, goals, etc. You name it and there&apos;s a question for it. You can answer none, some, or all of the questions. You can put a picture up with your profile or not. It&apos;s all up to you. No pressure. The website was just the thing for me. I had recently gotten out of a long-term relationship with someone who was not Iranian. That lengthy and often aduous relationship made me increasingly yearn for someone from the same cultural background that could relate to me. I realized that I wanted someone who understands and appreciates the importance I place on tradition, family, education; someone who understands the quirky things our parents do with their profusive taroff, elaborate parties, and the burning of esfand; someone who doesn&apos;t look at you with a blank stare when you mention ghormeh sabzi. I can tell you it&apos;s amazing to date someone who can relate to you on these levels whether they agree in principle or not. You have this instant connection with them. 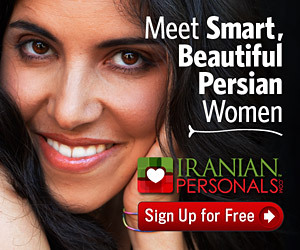 Personally, I had always shied away from dating Persian guys for two reasons. I ignorantly assumed that all Persian males fell into the same infamous category. You know, the type that sowes all their wild oats and does every possible deed under the sun. Then, when they&apos;re ready, mommy imports a nice little Persian virgin twenty years their junior from Iran. Though I don&apos;t deny that this group still exists, I have since realized through the personals, that there are many other categories out there as well. In fact, a good majority exists that does not subscribe to archaic notions of male/female relations and historic views of “proper” gender roles in the domestic and social spheres. There are guys out there who are actually open-minded and who are looking for woman who are equals, not clay to be molded into the perfect submissive wife who caters to your every whim as she cooks, cleans, and makes babies for you. There are guys out there who do not have this big “I am King” complex. I was taken aback and quite impressed. I have to say that I was even more impressed with the women on the site who have taken the initiative to place profiles on the site and who see nothing wrong with contacting men who they find appealing. I think women have to realize that partaking in such activities does not imply desperation. People need to realize that internet dating is one avenue of many that individuals can pursue if they are looking to meet compatible partners. Life is so hectic and fast-paced these days. Who has the time to constantly go out to various social arenas to meet when they are in pursuit of advanced degrees, trying to climb the corporate ladder, start a business, etc. This is not to say that one can&apos;t meet potential partners in a plethora of places. But why limit yourself? Why not use the internet as one such avenue? Gone are the days when grandmothers used to spend all their time playing matchmaker. Besides, do you really want your grandmother to pick a lifetime mate for you? Or ladies, do you prefer to stay home passively awaiting the appearance of some khastegar to come and sweep you off your feet into a period of engagement, commonly known as dating? This route may work for some and more power to you if it does. I can tell you that it&apos;s not for me. Why not be assertive in getting what you want. I&apos;m not saying to go out and chase men down like someone who&apos;s just escaped the loonie bin. All I&apos;m saying is to take a chance, put yourself out there, and be open to new possibilities. You never know what awaits. For me, it&apos;s been nothing but positive. I&apos;ve met alot of great people, made some good friends, had exposure to various aspects of Persian culture like the poetry of Rumi, the music of Shajarian, and the exotic rhythms of the donbak. So go out and take a chance. Just remember to be smart and safe about it.